Hear ye, hear ye! 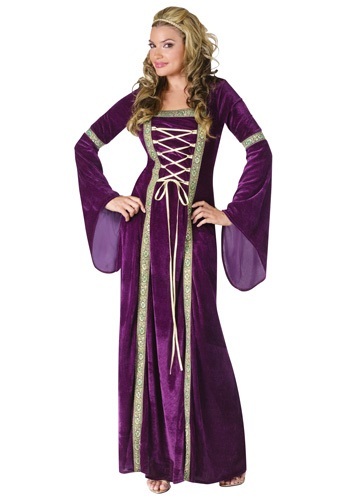 If it is the finest costume for your trip to the Renaissance faire that you seek, we hereby declare this lovely Renaissance Lady Costume as the look that will make you the fairest maiden at the festival! Don't you just love going to the ren faire? Everyone gets to walk around dressed up in cool old style outfits, eating turkey legs and drinking out of horns, and getting to experience a little piece of what life in a village during the Renaissance may have been like. That sounds like a pretty perfect day to us! The best part is that it's fun no matter how immersed you want to be, whether you like being historically accurate, or just want to wander about and see the sights. This makes it always a good idea to dress up in something that will let you fit right in with the crowds of dedicated faire-goers, but still let you sit back and enjoy the show! If you're wearing a noble gown such as this, you may even find yourself being treated like royalty, which is never a bad thing. The full length dress is made of purple velvet material, for a truly luxurious look, and features elegant brocade ribbon detailing for added authenticity. Add a pair of slippers or sandals, and put braids in your hair to complete this lovely, regal style, which also makes a great part of a Renaissance group costume. See you at the faire, but for now, we bid you farewell!